Mike Koop (left) is presented an award from AANC. The presenter is Kenneth Frank. This presentation was made at Slide and Equipment Night, September 17, 2005. Photo courtesy of Sam Sweiss. 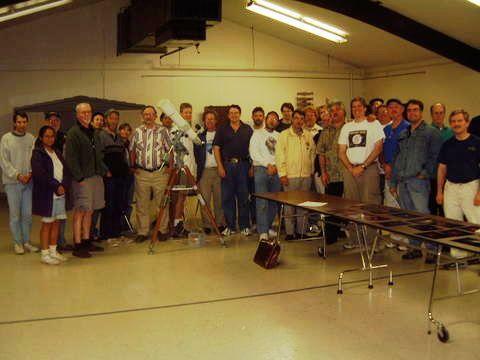 This picture shows some of the attendees at Slide and Equipment Night, Sept. 17, 2005. Names withheld by direction of the Department of Homeland Security. Photo courtesy of Sam Sweiss. 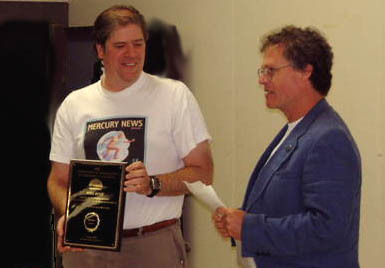 Mike Koop was presented the 2005 Astronomical Association of Northern California Amateur Astronomer Award at the Slide and Equipment night. He has been Vice President of AANC for 2 years & on the Board for longer than that and a fixture at the San Jose Astronomical Association for over 10 years. Mike has a way of staying under the radar. He has been President of the San Jose Astronomical Association for at least 3 years and is selfless and tireless with whatever project he promotes. Mike's big thing is the loaner program he manages. SJAA has over 33 working telescopes on loan (more than any club I know of). He single-handedly made a CD rom compendium of all the Ephemeris newsletters. Now that's a labor of love! Mike heads up the mirror making workshop atm classes. He's currently working on a club 10" mirror... ("how long have you been working on that mirror Mike? "), and does the "what's up in the sky tonight" portion of our star parties. He has been active working on insurance issues with all clubs through the AANC for over a year now. To quote Dave North, former SJAA President, Mike is: "An amazing engine of action for the astronomy community."